Paul Bunyan, as you are asked to remember him. This is a narrative of very heavy duty proportions. First published in Minneapolis in 1914, Paul Bunyan’s America-creating exploits were primarily the brainchild of freelance adman William Laughead. 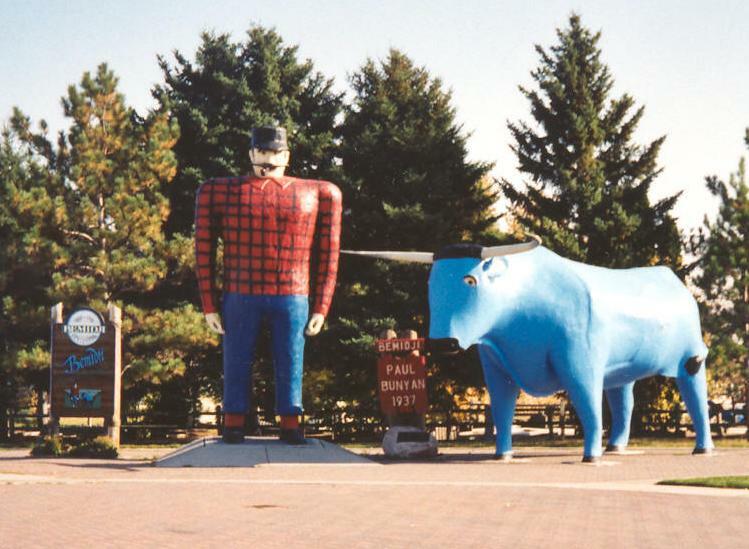 Loosely based in newspaper accounts of Scandinavian lumberjack tales, the stories of Bunyan and Babe the Blue Ox were the first heroes Minnesota proudly presented to the rest of the United States. Shortly after Paul Bunyan came Hubert Humphrey and Bob Dylan; after them, Prince and Jesse Ventura. Depending on your background and your passions, Louise Erdrich fits in there, in a timeline with John Berryman and Eric Sevareid and Mary Richards and Kirby Puckett and the Coen brothers Honeycrisp and Garrison Keillor. We have a lot of heroes in Minnesota. We can point to our larger than life figures as evidence of our great achievements, the cultural contributions of the superior men and women, but often, culturally, we get too hung up on cultural figures to create a cohesive story; or, rather, many stories that reflect the wide variety of people who currently inhabit the state. When we praise the Twin Cities, we find it easy to point to singular examples of achievement: one woman starts a community-oriented business, one man invents a product that surprises and astounds us. Look in our local magazines and newspapers: we celebrate in individual stories, profiles of people or businesses who made good under difficult circumstances. In such stories, an individual’s surroundings—Minnesota, the greater—are assumed to be familiar, the circumstances under which he or she differs lie only in family and neighborhood, but by being successful and making something for our own, we are all part of the same Twin Cities community. I’ve lived here for four years, and I stay here because I enjoy our mid-prairie semiutopia. The sheer level of activity in Minnesota—we bike! we ski! we make! we incorporate!—is leaps and bounds above any other place I’ve lived. Perhaps because we are often out of the national spotlight, Minnesotans also behave, unmistakably, like humans. We talk excitedly about the new stores and music and places we’ve discovered, hoping our finds will catch on with our friends. Minnesotans think we’re nicer than we actually are, embrace a catchphrase that facetiously admits to it, and at the end of the day, we still pat each other on the back for our efforts to be good people. Minnesotans, natives and transplants alike, are master explorers of the inner and outer worlds. Community! What a word! We talk about it constantly. At the Runoff we use it in our promotional copy. Stories about the Twin Cities by major media outlets reflect on the city’s community, panels of notables discuss our progressive community, and we look at our satisfaction with how our lives are going and attribute it to community. But in representations of community throughout Twin Cities media, we have trouble moving beyond an individualist point of view. We are eager to tell stories about how we are community-oriented, but we are not entirely sure what that means. Although we don’t require an explanation of a clearly defined Twin Cities culture before we read about local happenings, when we talk about our local culture we should have some conception of the assumptions we are making of our environment. Recently, a popular blog post by visitor to our area described the Twin Cities as “white, liberal, and cold.” It’s a cute designation, and it fits with contemporary advertising culture’s hyperpromotion of brand awareness. But it’s the same as a Paul Bunyan from a lumber worker to a giant who shaped America’s physical and cultural landscape―it’s based in some ideas we’ve thrown around, but it’s a complete fabrication. Even if it is a metaphor, labeling an area as “white” hardly encourages a community to think about its actual makeup. It’s easy to find strong Scandinavian traditions locally, sure, but it’s not difficult to find East African ones, either. In addition to prominent Latino, American Indian and African American communities, the Twin Cities are home to the largest Somali population in North America, one of the largest concentrated Hmong populations in the United States, and the largest Korean adoptee population in the country. The stories of these communities often get lost behind self-imposed cultural barriers—like labeling a major metropolitan area “white,” which is a label I have heard several times since I moved here in 2007. Often because of a lack of resources and an unwillingness to breach difficult barriers, immigrant populations are left to operate only within their own communities, or treated as token representatives, rather than as co-creators of the cultural fabric of the Twin Cities. If we’re bogged down with the statistics of a historical majority, how do we ever expect to foster acceptance and accommodate change? “Cold” is something we can all get behind, especially now, when it’s useless to bother checking the weather forecast because we’re all wearing long johns for the next two months anyway. But “cold” also refers to our inabilities to welcome others into our community. This may be because of the persistence of the “white” and “liberal” descriptors, with a few token outsiders to provide “diversity.” Perhaps we are “cold” because we have a hard time defining what community actually is. Local media seems to construct “community” as a collection of people who are doing things well, near each other, but not necessarily together. It’s no wonder that it’s hard to acknowledge outsiders when we struggle to put together our various puzzle pieces into cohesive stories about our communities. In November I attended a panel discussion called “Minnesota’s Identity and the Arts,” sponsored by the Minneapolis Arts Commission and presented by Works Progress. The panel successfully profiled four individuals and highlighted existing professional connections among local artists, but both the panel and the audience sidestepped comments that questioned the ideal of our Minnesotan community. Issues of race, gender, and class are routinely avoided in public discussion, partially because they require a more complex presentation than a series of biographies. We are happy to look at examples of ingenuity and be inspired by them; we are more reluctant to weave them all together into more cohesive stories—stories that contain multiple narratives that everyone, even nonlocals, can read and understand. At that panel, an audience member mentioned that Twin Cities artists are less open to critique than in other communities, and one of the panelists said that this may be due to our small population. Even though we are “cold,” there is little active criticism of local arts and cultural communities, save for where it is sanctioned—in reviews. But the Twin Cities cultural community, as a whole, is hardly a small town. Constructive critique, with specific suggestions about how to make change, can always make things better. It’s widely recognized that the switch to digital media panicked newspapers and severely changed the media economy to one that focuses on production of a large amount of small bits of content. It’s become extremely difficult to provide a continual story of how things got to be the way they are. Our two major newspapers are clearly strained for resources, local magazines are clearly aimed at a wealthy demographic that doesn’t necessarily reflect the multitudes of our fine cities, we lack a multifaceted city-focused blog in the vein of New York’s Gothamist, and our alternative weekly has gone the way of alternative music. Online media outlets provide additional flecks of news or analysis (the Twin Cities Daily Planet has excelled at covering shorter news stories from different communities), but weaving the small bits of our stories into something accurate, inclusive, and complete requires more intensity and more development. We are a storytelling community. We want to discuss our community with ourselves and others. But when faced with difficult questions—how come our immigrant communities aren’t covered in local media unless there’s a crime? how come criticism of major local corporations is relegated to national and niche publications? why do we still think of Minnesota as “white”? why are women severely underrepresented in local news coverage, except in the case of sexual and domestic assault? why do sexist statements and stories frequently make it into local papers and magazines? is this working? how can we do this differently?—we tend to freeze up and say, “We’re trying to fix that” without addressing how. It’s not that we’re insensitive because we genuinely want to solve these problems. Minnesota is a haven for the earnest. We desperately want to be the community we celebrate. It’s just that we seem to have trouble incorporating the things that make us uncomfortable. And, really, it’s all in how we tell the story: Historian Hayden White wrote that we derive our cultural meaning from how we collect it into a narrative. Instead of listing events in chronological order, as medieval annalists did, we collect our cultural meaning from how we tell stories: what we choose to put in, and what we choose to leave out. Our values are reflected in not just who we are telling the stories about, but in how we generate those narratives. Last year, the Twin Cities Runoff began publishing stories that we hadn’t seen in the local media, longer stories that gave an in-depth look at the myriad of definitions of our local culture. We wrote about women’s and LGBTQ bike activists, yard sales in Northeast Minneapolis, the Hmong New Year celebration in St. Paul, in-home art galleries, and spoken word and slam poetry. We collected our thoughts on local small businesses to support at the holidays, and we published some fiction and a personal essay from local authors. We published illustrations and photos. We compensated our contributors. And we’re looking to keep building communities by looking for innovative ways to tell stories. We know that we’re not the only ones. We Twin Citizens see our cities as bright, friendly spots on a dark, lonely prairie. We pride ourselves on our rich cultural heritage and our community spirit, even when the definitions of those are fortunately less stable than in Paul Bunyan’s early days. There is more than one way of telling our story, as long as our assumptions and our frustrations don’t cloud our abilities to create. All it takes is a little bit of real, actual, outreaching community.